WordPress is a free content management system that allows you to build websites. 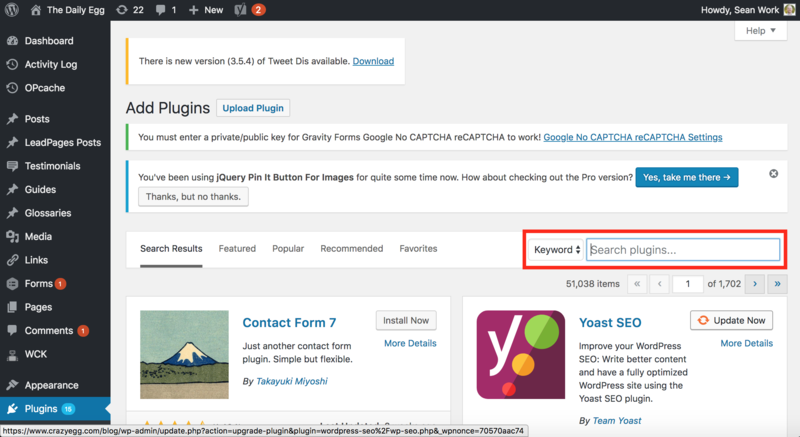 We created a plugin so you can easily install Crazy Egg on your WordPress website. Click on Plugins along the left-hand side. Click on Add New in the submenu. 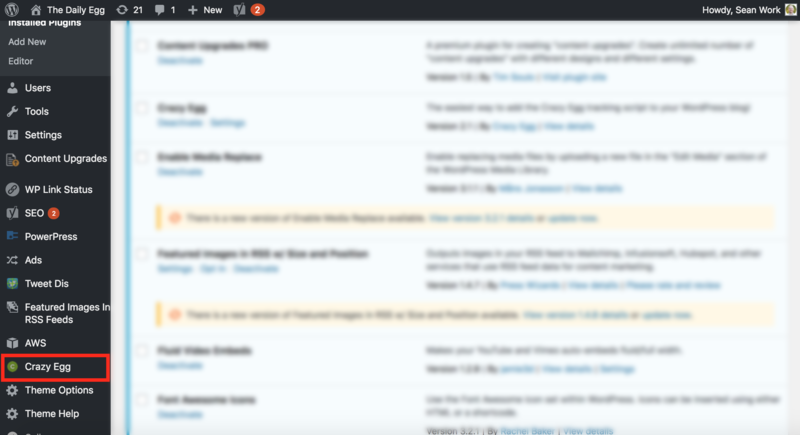 At the top right-hand corner, type in Crazy Egg within the Search plugins… input field. Find the Crazy Egg plugin. Click on Install Now and Activate. Click on Settings under the Crazy Egg Plugin. Or, click on the Crazy Egg tab along the left-hand side. Copy and paste the Crazy Egg tracking script that can be found here into the Your Tracking Script input field. Wait a few minutes before you check the installation. The thing to remember about WordPress sites is that they are heavily cached and therefore will not update the live public version of your site with changes right away. Therefore, checking the installation right after you've activated the Crazy Egg plugin will result in a false negative. Rather, go ahead and create your snapshot and check back on it in a couple of hours. If you are using a Cache plugin on your site, you will need to clear this cache after installing the Crazy Egg plugin. Since WooCommerce is a WordPress plugin, you'll be able to track your store without any issues as soon you install Crazy Egg.